Thundereggs, including both hollow geodes and solid nodules, are available in quite a number of different places in the Wiley’s Well region of the Colorado Desert in southeastern California. Thus far, those found on the small, twin-peaked volcanic butte just south of Rainey’s Well mark the western extreme of where they have been located. Although the Black Agate Thunderegg Mine, with its spectacular thundereggs with black agate cores, is only 4.5 miles to the east, those from the Rainey’s Well collecting site show little or no black agate. Instead, they fairly closely resemble those from the southern part of the Potato Patch, located several miles southeast. In size most range from slightly less than two to more than eight inches in diameter, with the great majority measuring about three inches across. A very few have measured up to 16 inches in diameter. Smaller Rainey’s Well thundereggs are often nearly spherical. These smaller ones, up to a little more than two inches in diameter, include quite a number of solid-cored nodules. Their chalcedony interiors frequently are colorful, often containing both fortification and waterline agate along with quartz crystals. Larger thundereggs from the site almost always are hollow and to a certain extent, elongated and otherwise deformed. Their rhyolite exteriors are very warty in appearance, and their interiors often are lined with small, white calcite crystals. This collecting site is nowhere nearly as broad as the far better known Potato Patch, Hauser Beds, Straw Beds or Hidden Saddle Beds. Until now, anyway, it is by far the least extensive of the geode sites in Wiley’s Well rockhound district. Only a comparatively small amount of digging has been done at the site. It may be that additional searching and digging at this and other similar volcanic buttes to the immediate south and east will turn up more geodes and nodules. 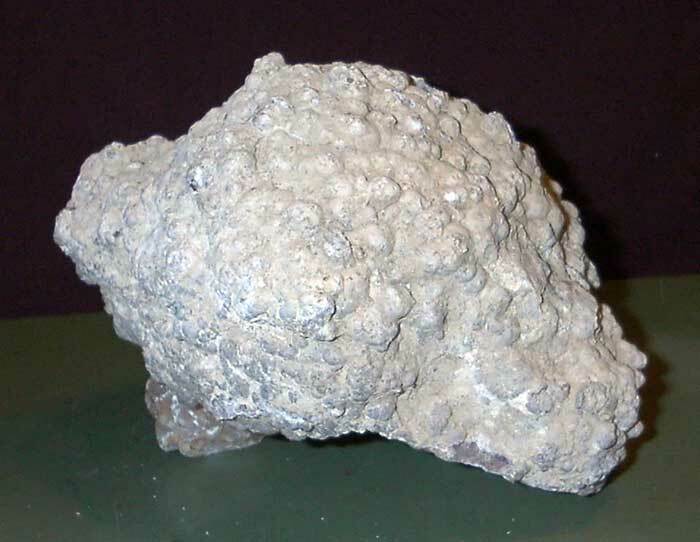 When Rainey’s Well thundereggs have been exposed to the ravages of the elements for a long time, their rhyolite exteriors can wear quite thin or even disappear entirely. Chalcedony thunderegg centers, both hollow and solid, can be found at the western edge of the site, just as they sometimes are at the eastern and western edges of the Potato Patch or the eastern limit of the Straw Beds. Do collect them. While they may not be as large as pristine geodes or nodules, they can, when cut open, be just as colorful and attractive. 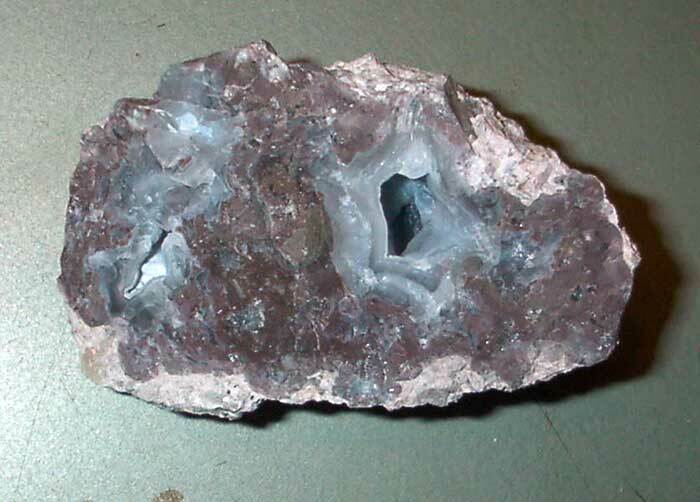 Look for pieces of chalcedony with the distinctive “star” shape of thunderegg interiors. Rainey’s Well, located a few hundred feet to the north of the dig, at one time provided water for two nearby ranches, one owned by J. C. Rainey and the other, by J. W. Bell. Both ran livestock in the area. Because of the creation and growth of the Chocolate Mountains Bombing Range, though, Rainey and Bell were forced to give up extensive grazing rights. That made cattle raising economically impossible, so Rainey decided to use water from the well to irrigate peach and apricot trees. Unfortunately for all concerned, the trees did not thrive. In fact, it appeared that the water from his well poisoned them! He then turned to raising goats, which is why the area sometimes is referred to as “the goat ranch.” That, too, failed. The Raineys then abandoned the ranch. About all that remains of it are a few fence posts, slab floors and Rainey’s Well. The latter now provides water for an animal guzzler. 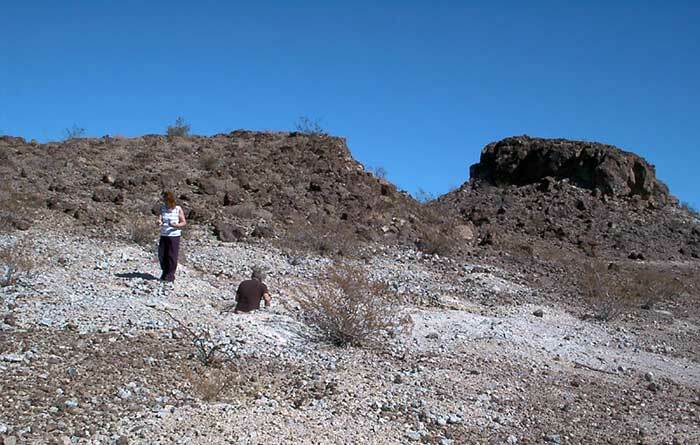 The butte where the thundereggs are located provides a good view of the site of the former ranch. While there are several routes leading to the Rainey’s Well thunderegg-collecting site, the two most frequently used both lead southward from Interstate Highway 10. The first leaves the freeway via the Wiley’s Well exit, located about 16 miles west of Blythe, California, and turns southward on Wiley’s Well Road. From the middle of the overpass at 33°36.466' N and 114°54.101' W, drive south approximately 2.9 miles to the end of pavement at 33°34.183' N and 114°53.882' W. Continue southward another 5.9 miles on a graded dirt road. (This road can be quite washboarded.) About 0.2 mile south of the entrance to the Wiley’s Well Campground, you will reach the intersection of Wiley’s Well Road and the Bradshaw Trail at 33°29.457' N by 114°53.278' W. To reach the Rainey’s Well collecting site, turn right and drive westward on the Bradshaw Trail 18.6 miles to its junction with Graham Pass Road, at 33°25.421' N and 115°10.347' W.
The second route leaves IH 10 about 21 miles west of Blythe, at the Ford Dry Lake exit. At the middle of the overpass your GPS should read 33°36.444' N and 114°59.402' W. On the south side of the freeway turn west (right) onto Chuckwalla Valley Road, a stretch of old U. S. Highway 60. Drive 3.0 miles to Graham Pass Road, at 33°36.358' N by 115°02.483' W. Turn south (left) on Graham Pass Road and drive 16.4 miles to its junction with the Bradshaw Trail at 33°25.421'N by 115°10.347' W.
Regardless of which route you take to the Bradshaw Trail and Graham Pass Road junction, you will, from that point, drive southwesterly on the Bradshaw Trail 0.2 mile to the junction of a road forking off to the left at 33°25.398' N by 115°10.581' W. A sign used to indicate that this was Fort Sumner Boulevard. Before that, it was part of the old Blythe-Niland road over Salvation Pass. Nowadays, the road is closed to the public approximately 3.1 miles ahead, at the boundary of the Chocolate Mountains Aerial Gunnery Range. Nevertheless, this is the road you want to get to the thunderegg-collecting site. So take the left fork and drive 0.7 mile to 33°25.389' N and 115°11.282' W. Turn left again and drive a little more than 0.3 of a mile to an apparently infrequently used road to the left at 33°25.084' N by 115°11.482' W. Turn left yet again, heading upward on desert pavement. Drive east 0.1 mile up to a little saddle overlooking the surrounding area and marking the center of the Rainey’s Well collecting site at 33°25.071' N by 115°11.408' W.
Thus far the majority of the geodes and nodules collected have been taken from the slopes well below the level of the saddle, mainly from the dug-up area you pass on your left as you begin the steeper part of the climb. It appears, though, that many of them may have rolled down from one or more sources higher on the butte. A few very large geodes, some measuring as much as 16 inches in diameter, have been dug from beneath the rock “cap” adorning the southeastern part of the butte. Thus far, though, almost all such very large eggs appear to be duds containing little or nothing worthwhile in their hollow cores. Rockhound logic implies, however, that where there are duds there are bound to be some good ones, so it might be rewarding to spend at least a little time looking for them around the edges of the cap. As recently as late 2002 it still was possible to spot occasional thundereggs on the surface of the ground. Now, though, most are obtained by digging. Be sure to take tools such as picks, shovels, sledgehammers, drills and pry bars. Gloves, some kind of eye protection, and a hat can help, too. The best time to visit Rainey’s Well is during late fall, winter or early spring, when daytime temperatures are reasonably comfortable. Summertime high temperatures commonly exceed 110 degrees in the shadeand there is no shade at the main thunderegg dig. The nearest source of services and supplies is Blythe, more than 40 miles east, so be sure to take whatever you may need. Among other things such as food for yourself and those with you, and oil for your vehicle, be certain to take plenty of drinking water. Then, be sure to drink what you take! Do not drink water from Rainey’s Well or from the guzzler because it is contaminated. This is a remote area, with any help a long way away, so be sure your vehicle and its spare tire are in good condition. While four-wheel drive may not always be absolutely necessary, it is highly recommended. If your vehicle does not have it you should carefully inspect any sandy areas before entering them, especially those near the well. In fact, the area of loose sand immediately west of the well has occasionally proven treacherous even for vehicles with four-wheel drive. It is best to stay on hard-packed, well-established roads. Reasonable ground clearance will be helpful. The safest way to visit this area is to use the buddy system of having at least two vehicles caravanning together. Should one fail the other is available to provide help or to go for assistance. Carrying a sturdy tow strap is always a good idea. Overnight camping is allowed on public land in the area as long as one stays within 300 feet of an established road and more than 500 feet away from any source of water for wildlife. Rangers from the U. S. Bureau of Land Management enforce a 14-day limit. Please respect “No Trespassing” signs, and any others. If you follow the rules, come adequately prepared, and dig into that light-colored soil  said to be decomposed perlite  you should soon be unearthing Rainey’s Well thundereggs galore. Reports for early 2007 indicated a recovery rate of fifteen or more per hour for enthusiastic diggers. Be careful not to get too aggressive, though, because quite a few of the thundereggs seem to be rather brittle. They tend to break more easily than some from other areas.